Something about fall gets our creative juices flowing, and what a perfect time of year to incorporate this whimsical holiday into your classroom. Whether it be through parties, centers, or instruction there are tons of great ideas brewing out there! 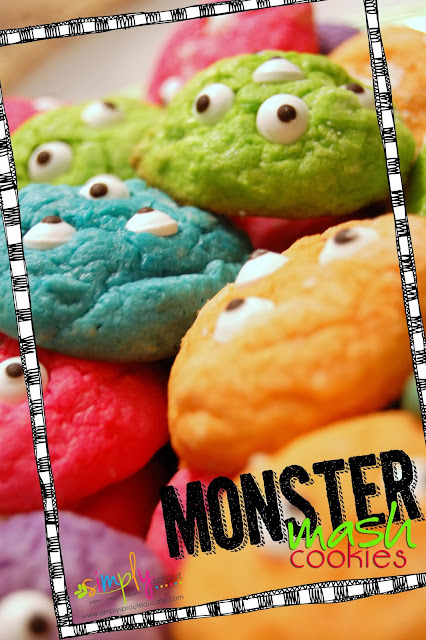 We just love these monster cookies from Lil Luna. We created a math activity that incorporates this sweet treat. Combine this with the newly release movie Monsters University and you have an instant afternoon of Halloween fun for your students. Add food coloring to each individual bowl and mix until all combined ( I used Wilton gel coloring). 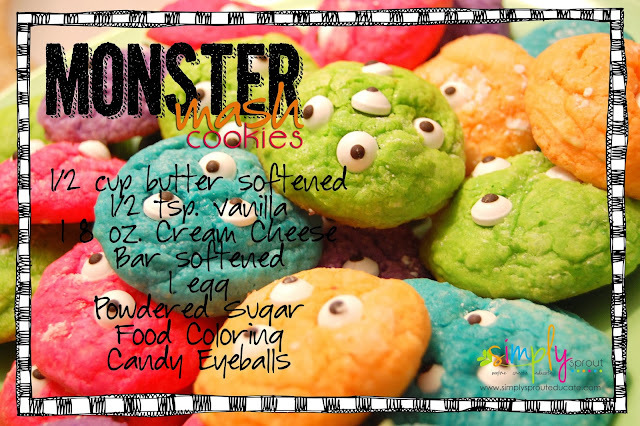 After cooking, add candy eyeballs while cookies are still warm. Take these yummy treats and turn them into an instant math lesson, review number words, color words and addition with our fun worksheet below. 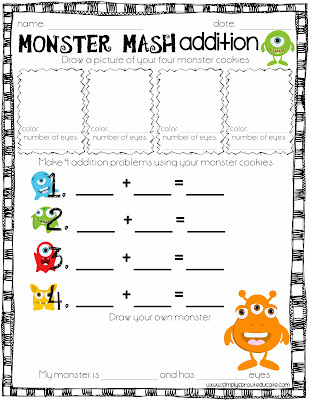 Just give students 4 cookies, have them draw their cookie then write down the color and number of eyes each one has. Using their cookies have them come up with 4 different addition problems and write them on their paper. When they are done have them create their own monster and then describe how many eyes it has as well as the color. Your students will love this yummy math lesson. Check out MONSTERS UNIVERSITY out now on DVD. Have students watch closely and try to tally how many monsters they see that are blue, pink, green, yellow etc. Wishing everyone a Happy Halloween with tons of Monster fun!